In Woolly Mammoth in Trouble, the trouble is big! He lives in the Ice age in Europe and a huge snowstorm is coming in. Soon he realizes that he is lost and a big catch for the saber tooth tigers creeping in. 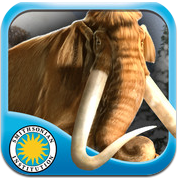 Read along to discover what happens to Woolly in this Smithsonian Institute’s approved app. The graphics and audio are fantastic and sure to hold kids attention! This app is presented to us by Oceanhouse Media. This series of book apps also features reading readiness with highlighted words and characters that are shown and pronounced when tapped.